Community service program for me was a break from the corporate cycle and was an opportunity to do something I love. What I love about community services is that you get to be a change maker. Making an impact in someone else’s life and put a smile on their face…. This gives me life satisfaction and makes me happy. As an alumnus, I wait for this event all year long. Thus I have managed to be a part of the community service this year as well. This year I was a part of personal Hygiene and Self Development team. We worked with the students across grade 1 to 9. 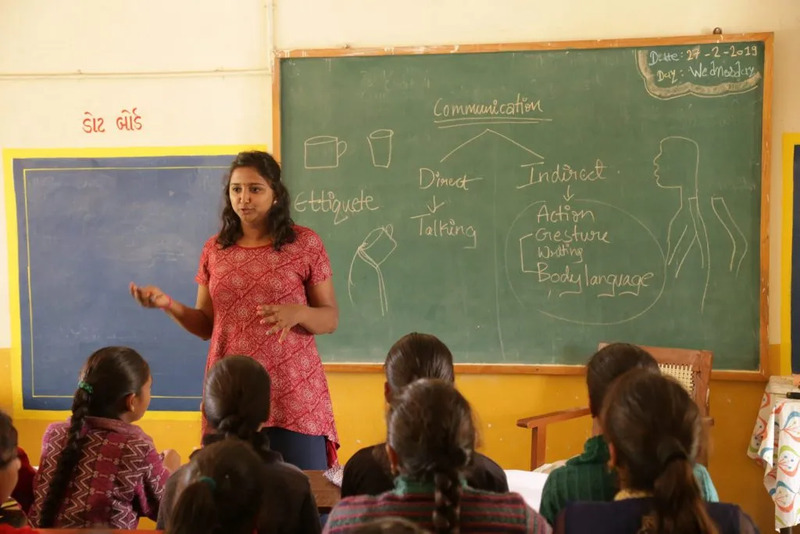 Our focus areas in personal Hygiene was Cleanliness in school, Cleanliness at home, menstrual hygiene and Fitness through Zumba. In terms of self-development, we focused on communication styles, basic English communication, grooming, etiquettes, mental and emotional well being etc. We also learned that the students of Palaj take school cleanliness pretty seriously and they clean it religiously! We had so much more to learn from the kids in the school. The highlight of the program for me was that the children were really curious to learn what we had to teach. They implemented what we taught in practice. For example, I taught them how to use vowels. In the session, while introducing themselves they used to say ” I want to become engineer”. Post session, they corrected their sentences and were able to say ” I want to become an engineer”. Some of them were so curious about certain information and wanted to learn more about the reason behind why we do certain things, especially in the menstrual hygiene sessions. The kids indeed made me feel valued and expressed that everything we taught over the week mattered to them. There is nothing more one can take back other than such wonderful experiences and the love displayed by the kids.